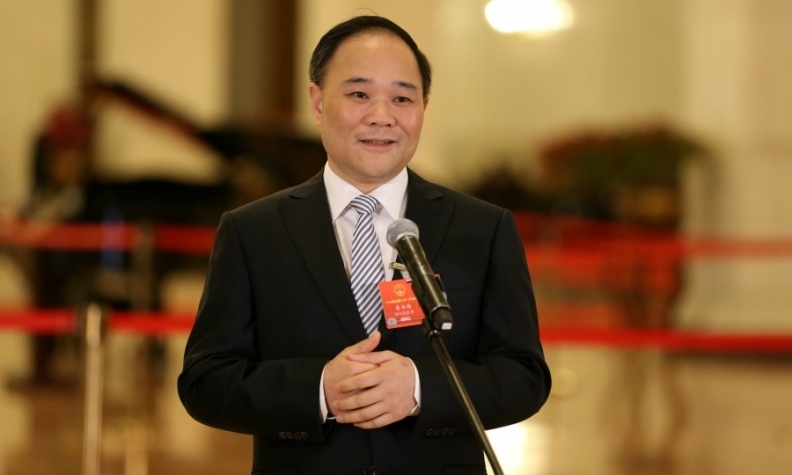 Li Shufu, founder of Geely and owner of Volvo, acquired 9.7 percent of Daimler in February. BEIJING -- Daimler has a back-up plan in place to protect itself from any unsolicited takeover bid should its new Chinese investor turn unexpectedly hostile. Li Shufu, founder of Geely and owner of Volvo Cars, acquired 9.7 percent of Mercedes-Benz maker Daimler for 7 billion euros in February. The Chinese auto tycoon has since said he will not add to his stake, the largest owned by any single Daimler shareholder. "We have dealt with such a theoretical [takeover] scenario and prepared ourselves, but there's no reason whatsoever to think about that in this relation," Daimler CEO Dieter Zetsche told reporters during the Beijing auto show last week, saying nothing so far has indicated that Li was considering a hostile move. "Of course, we have general plans – general – for such a situation, which we typically don’t announce, because then they already lose half of their effectiveness. But it's clear that this is totally independent of this case." Zetsche said he was "totally fine" with the current stake holding. Nor had the Daimler CEO asked for any guarantees from Li in their subsequent discussion. Any further move would be substantially more expensive, he said, now that markets began pricing in a possible bid by the Geely and Volvo owner. Li himself has taken a quieter approach after initially telling German newspaper Bild that he neither needed nor asked for permission from Beijing before targeting a German industrial icon. In an interview with Bloomberg, the strategic investor said he did not need the usual synergies for the 7-billion-euro investment to pay off, suggesting he would be perfectly happy receiving a dividend just like any other shareholder. Zetsche said talks continued with Li over the latter's wish for a collaboration, but said that they had not gone beyond a simple exchange of views on how the industry is developing and where teaming up might offer better opportunities for the future. "Nothing is specific, even less so has anything been decided," Zetsche said. "We are not even in the position to really define the areas of investigation, but it's early stages so that’s totally normal. It's very amicable and very constructive." If Li did secure more funds and received the political backing in Beijing to make a play on Daimler, this wouldn't be the first time for a German automaker that a presumed white knight turned out to have darker intentions. Porsche started out as a friendly investor in Volkswagen when it first announced in September 2005 plans to acquire 20 percent of the votes. It remained quiet while continuing to add to its holding. Eventually however, it turned hostile and Porsche attempted a leveraged buyout of Volkswagen that would be financed by using VW's own cash reserves. Fearing job cuts, labor unions and the German state of Lower Saxony defeated the plans and key shareholders from both companies stuck a deal in 2009 that saw Porsche remain VW Group's largest shareholder at the cost of firing then-Porsche CEO Wendelin Wiedeking and finance chief Holger Haerter.